So I'm just starting to learn the game and I'm trying to figure out the way the health chart works. The book says Earth=the number you put in the wounds box. But in the example they give on diagram 6-2 the box has a 4+ when it explains that the Earth score is 5 and the Water score is 4. 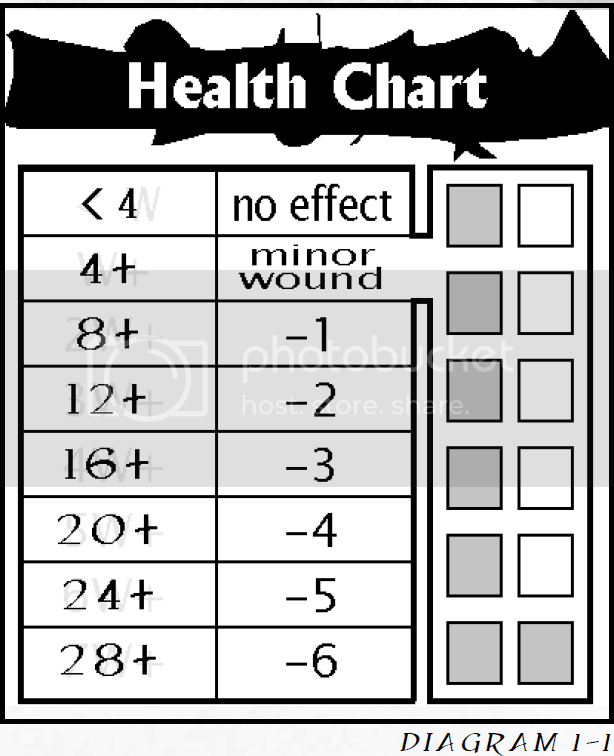 Later in diagram 6-4 the minor wound is 3+ while it is explained that Earth is 4 and Water is 3. Is there something I'm missing here because that doesn't make sense. This is a point for the errata file, still a shame they didn't put it on the website for Fireborn (!). There was an old minisite for Fireborn which did keep the eratta file, but long taken off the web. You can still find the eratta for the book under the name of "Lost Lore"
I had a print version of it along with my print copy of the book, but it never got put up as free download or included with the Fireborn pdf for whatever reason.. (I'd say lazyness). You are correct, and the diagram in the book is wrong. 1–1 as shown on the opposite page. Find the full pdf file on the googledrive area in my sig, I strongly suggest getting the eratta as it fixes/clarifies quite a few bits here and there. Ok thanks. I didn't use the down load you put up (It wanted me to download some stuff I wasn't sure about) but I still found the Lost Lore Errata, thanks though. however I came across another problem between today and yesterday that the errata isn't clearing up. It didn't mention how weapons work, not that I could find anyway. If I understand it, weapons have a weight which determines the number of ready actions are needed to use it again as well as draw them. Yet it also states that the weight is the base requirement but also briefly mention a weapons ready requirement, (All this on page 140 of the hand book) how does that work? Also it doesn't explain modern weapon reloading. The closes thing I could find was in the Errata when it explained ranged mythic reloading which doesn't look anything like the modern one. How does it all work? Google drive asking to install questionable programs? I think you mean wanting to install a google drive program, you should ignore that and just continue pushing the button stating "no thanks". It should only ask once, and yes...google drive can be accessed only if you have a google account I believe. I may need to find a better/easier site to upload the stuff for easy access, but didn't foresee this problem before. How it works is pretty simple, but I can generally understand the book can be rather confusing at times.. It desperately needed a revised edition, but sadly never got the chance or ever will. The amount of ready actions required to bring a weapon to ebar or use it for a second time in combat is indeed based on "weight". A light weapon requires 1 ready action, medium weapons require 2 ready actions, and heavy weapons require 3 ready actions. The term "weight" should be used a bit lossely, as generally it's also definign how awkward the weapon is to wield. Making small weapons favourable in such situations. If you have multiple weapons to use in combat, it can help out, as you could potentially use your right fist to punch, then your left fist, before needing to ready one of the punches for a third attack. For reloading, it's not stated on the page you mentioned, but is stated in the chapter where equipment and weapons are explained. In essence only ranged weapons ever need/use a reload to take place, and work a bit differently from melee weapons during combat. A ranged weapon has a weight (even though have of the weight/reload stats where missing from the book(! )), which is only used to bring the weapon to bear if you didn't already have it in your hands ready to shoot. For older weapons, generally all of them have an ammo of 1, and require active reloading every turn. In modern times, guns have generally much bigger capacities, so their ammo is higher. In this case you can have a pistol like the Glock 34. Ammo is 18, so got a nice ammo capacity before you need to reload. Pistols are concidered light weapons, so taking a pistol from your holster takes only 1 ready action. For reload it states 2/3 , this means that after every shot, you need 2 ready actions to reset the trigger to fire a second time with the Glock 34, however.. once you emptied out the entire ammo clip, it takes 3 ready actions to exchange the entire clip for a new one. Some weapons are easier to reload or ready, and depends on the gun in question, but are NOT related to the weight of the gun itself. Overall you're much likely to use the ready actions stated under reload the most, as the size of guns only matter at the start of combat if suprised. Guns are likely to be shot multiple times per turn (if it's not a bow anyway), but please note guns should be rare in the setting. As written, firearms are very deadly, and at most hand guns can potentially be available to some characters with the proper background (police officers). Sorry if it's a bit of a quick reply. I may have missed a few things, but have to get to bed....it's a bit late when I saw your post. Magic is a bit fiddly.. so I fully expect there to be many questions. I also housruled it á bit, as needing two rolls for spellcasting felt cumbersome. (you take both a physical Fire (casting) action as well as a mental Air (casting) action to cast a spell. While it is meant to make it harder to cast spells and use up your dice shifts (making you more vulnerable in defense), I much rather have 1 roll for casting to speed it up. I use only the Air (casting) action, but it's still rulled as casting taking both physical and mental actions to complete. Only the Air (casting) roll actually has penalties if it fails. (gathering taint if not enough successes are rolled, or overkill damage if too many (but can be absorbed by casting options if you know them). However if you get attacked during that round, and you must defend you first defend, then take the fire action to keep your spell under control or it fizzles out. Most of the time my players make sure the caster is well defended or at a safe spot so it doesn;t come up much. The other method (perhaps even easier) you could use is simply stating it is a full round action taking both mental/physical actions to cast, and takes up an additional stance shift by default. Just to remove the fire roll removed alltogether if needed. It works as written as well, just an extra roll to take for mages.